Panasonic have carved out a respectable name for themselves in the digital appliances world – their reputation is for products that are largely inexpensive, yet sleek, reliable and packed with features that just work. 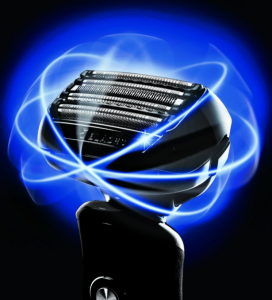 As we will see in this Panasonic Arc 5 Review, they did not hold back in the electronic shaver market either. We have already reviewed the Panasonic Arc3 and Arc4 in previous posts and as we found out, their shavers are simply laden with features, and they have openly declared war on higher-end products with their well-priced shavers that shine as brightly as more expensive ones. Before we dive into the detailed review, let’s check out the summary box. Facial contours have, for many years, stumped shaver designers. 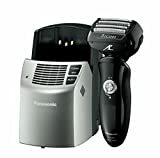 However, Panasonic have trumped the competition with the Panasonic Arc5, as they did with this shaver’s younger brothers, the Arc3and Arc4. Not only are the heads of these shavers fully flexible and pivoting, but the very foil is built for troubled landscapes. The MultiFit Arc Foil is built, as the name might suggest, in an arc – that fits all trouble areas. The foil is also designed so that it doesn’t hurt if pushed into the skin, resulting in a very clean and deep shave. No need to return to problem areas. In the past, many men have been led to believe that a close shave can only be achieved with a razor blade. However, this is not the case with the Panasonic Arc5. As with its younger brothers, the Arc3 and Arc4, 30-degree inner blades are loaded with nanotechnology, which cuts the hair right down at its base, achieving an extraordinarily close (yet painless) shave. In the world of close shaves, this shaver is right on the money. Unlike the Panasonic Arc3 or Arc4, however, this shaver has five blades, which results in maximum comfort, quality and a reduction of shaving time. The main difference between the Arc3 and the Arc4, we found, was the vibrating outer foil. This shaver, the Panasonic Arc5, however, goes a step beyond. The foil of the Panasonic Arc5 is endowed with revolutionary LiftTech technology – reverse tapered edges lift hairs and cut them, which means that level-lying hairs are not spared, even in trouble areas, such as under the chin and on the neck. Not only does this reduce the time it takes to shave, it also reduces irritation, as the shaver doesn’t need to be pressed any harder against the skin than elsewhere. The main emphasis of the design is on functionality – unlike the Remington XR1370, the aesthetic aspect of the shaver is a little less classy, a little more functional. Although it looks slightly sleeker than its younger brother, the Panasonic Arc3, this shaver still doesn’t look quite as good as many others on the market. This shaver is brilliant. There are no two ways about it. As with the Arc3 and the Arc4, it does all things you expect it to and a handful of things you don’t expect it to. It’s just good. 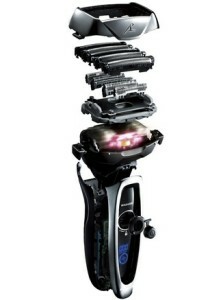 However, unlike the Arc3 and Arc4, this shaver, the Panasonic Arc5, has a more serious price tag attached to it. Whilst it is still good value for money, it doesn’t do much more than the Arc4 – is it worth the difference? The main difference is the LiftTech technology; whilst this is a brilliant feature, it is also available with Braun’s Series 7 790cc, which is a lot cheaper. We’d definitely recommend this shaver, but it’s not our cash in the balance.